This week I'm obsessing over bedrooms so it's only fit to do a bedroom Pinterest edition. Join me in lusting over these amazing bedrooms. 1. 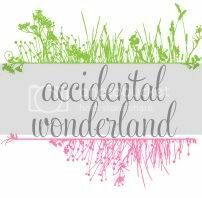 Isn't this just magical! 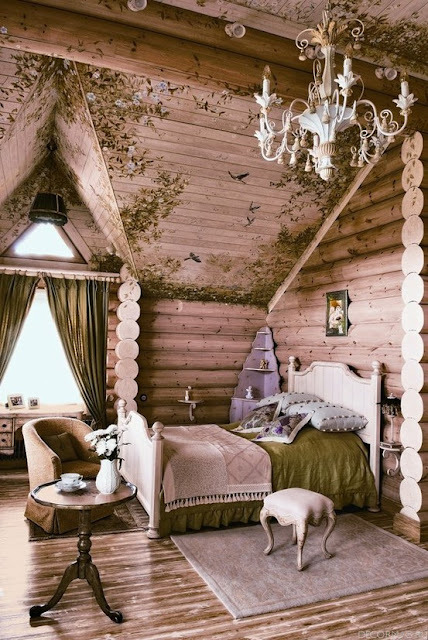 I would love to live in the trees like I imagine this bedroom would be. Oh this will be in my dreams tonight. 2. Books everywhere, the wallpaper, lots of pillows, the metal light, and the window at the head... ahh... not the bedroom of a parent. I wish I'd had a bedroom like this when I lived by myself. 3. I don't usually like a brick wall but that one is beautiful. Add in the chandelier, beautiful vintage furniture, simplicity of the fresh white sheets and you have this stunning bedroom. 4. Mystical and magical is defined by this bedroom. 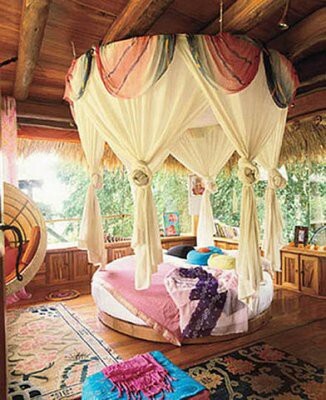 I want a tree house so I can have this beautiful bedroom. I'd string fairy lights around the room too. 5. 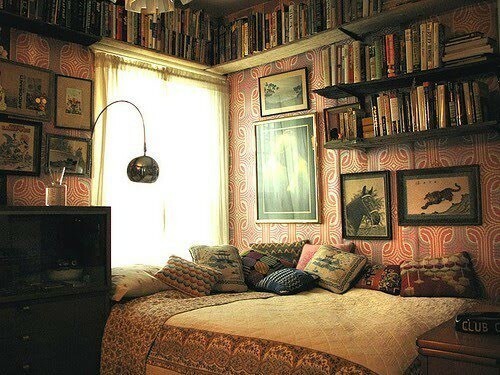 My favourite; this extremely feminine room. It ticks all the right boxes; chandelier, pale pink walls, flowers, lots of pillows, white antique bed, mosquito net. Ahh.. beautiful. Ooooh some very gorgeous rooms. I found that picture of the tree house one a while ago and it sits in my pictures folder because I love it so much. You're right, fairy lights would look AMAZING in that room. Beautiful - i love the 2nd and 4th ones the best! That room with the brick wall has been in my favourites file for a very, very long time. These rooms all make me feel like cuddling up in the sheets with a book! Sigh... how lovely would it be to doze off in these rooms? I think I have the second one pinned too! ohhh i would love any of these bedrooms! I would love any of these bedrooms - particularly if some one else would keep them clean and tidy for me! The first one for me!! Just stunning.